Make a monetary donation securely on-line. 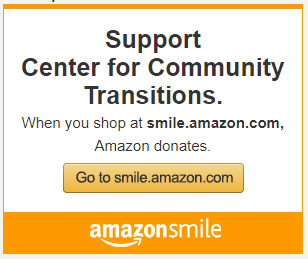 When you shop with Amazon, you can help support CCT at the same time. And, better yet—it won’t cost you a thing! AmazonSmile is a website operated by Amazon that lets customers enjoy the same wide selection of products, low prices, and convenient shopping features as on Amazon.com. The difference is that when you shop on AmazonSmile, the AmazonSmile Foundation will donate 0.5% of the price of eligible purchases to CCT. Start supporting CCT today! Call 704-494-0001 ext. 23 for information about our broker, account identifiers and other details. Donate Clothes To Goodwill On Wilkinson Blvd. Donate your gently used clothes to the Goodwill store located at the Goodwill Opportunity Campus on Wilkinson Blvd. and tell them your donation is on behalf of the Center for Community Transitions’ LifeWorks! program. When you do so, a CCT client receives a voucher for clothing. Cleaning supplies such as broom, pail, floor cleaner, bathroom cleaner, etc.